Don 2 was so much fun! I really like the 2006 film, and this is a great second chapter. Don 2 is not a police procedural or an examination of the drug trade. It’s one man’s fight to get his life back and live on his own terms. Does it matter that his life is based on drugs, murder and mayhem? Not really. You don’t have to like him or his business to wonder how he is going to do it. Looking bedraggled and scruffy, it seems life on the run since the first film has been hard on Don (Shah Rukh Khan). He is tired and wants to go back to the high living he is accustomed to. He will have to eliminate his enemies and outwit the law. But if your cash flow depends on trade of some sort, how can you kill everyone and still be in business? And what to do about those pesky police? The gleefully improbable plot rolls on with a cast of human dominoes set up and knocked down as Don wreaks havoc. Farhan Akhtar clearly didn’t invest as much in his writing as in the visuals, and while that does lead to some WTFery, it is so entertaining that I didn’t care one whit. The double crosses and manipulation drive the plot along at a cracking pace. SRK started his career as a baddie and that is my favourite kind of role for him. He brings a reptilian coldness to Don that is usually masked by a twinkle and a smirk, and his charm is used deliberately to seduce or scare. Don is an enigma and I like that. I find it tiresome to have every villain given a tragic back story so we can see how they went bad and feel sorry for them. Don is unapologetic and he is not looking for moral redemption. He’s also quite irritating, as though he is so bored by always being 3 steps ahead that he acts up just for fun. Actually, he reminded me a little of a much loved pet, my tiny Chihuahua who always acted like he was a big scary dog – they share the same self-belief. Don may seem smaller and less impressive than his opponents, but he has supreme self confidence, and no sense that he may appear to be ridiculous. The dual roles of the first film have been transposed into two sides of his character. Shah Rukh shows a playful side when he is taunting adversaries or flirting with Roma, but he also shows implacable rage when he is thwarted. Don never gives up on himself and that’s why he outlasts his enemies. Considering the number of people he hired or could afford to hire, Don was very hands-on and a control freak. What a nightmare boss! No wonder he struggled to find good help. Don’s wardrobe lacks the flamboyance of the first film which is, perhaps, a shame. I suspect some of the drug lords’ attire in an early scene was inspired by him, so there are a few choice shirts on display. Don has a predilection for leather, but usually keeps it simple. The characters don’t look like tourists in Berlin – there’s no blinged up denim in sight. They dress to blend in and to suit their role. It’s a small facet of the great attention to visuals throughout the film. Shah Rukh does get some very bad hair in the first section of the film. I hoped his microbraids may have housed an ingenious MacGyver style mechanism for a jail break, but no, it was just another bad wig. Maybe in the next film! Priyanka is good as Roma, although her role is less prominent this time. Roma is a driven career cop, as obsessed with Don as he is with himself. Their love/hate attraction is still there, and Don knows it. Roma has a strong but lowkey presence, feminine but not girly. Sparks fly in her verbal encounters with Don and the dialogue crackles and flows between them. But what has Priyanka done to her nose? It was quite distracting. Ayesha (Lara Dutta) is not just Don’s piece of fluff, she executes some important tasks, and Lara played Ayesha as smart. But there was little for her to do and she is a better actress than this role allows her to demonstrate. Sadly the one big dance number was picturised on her and she looked badly dressed, awkward and out of time. Boman Irani was in scene stealing form as the former kingpin Vardhaan. He is such a good actor that I sometimes forget he is acting – I just see nice, likeable Boman and then he turns evil. He is the ideal counterfoil to Shah Rukh’s preening Don, adding a heavier energy to the ensemble. He also scored some of the biggest laughs with a scene involving a scientist who was so boring you could almost see Vardhaan aging as he listened. Kunal Kapoor looks set to inherit the franchise as son of Don or something. As hacker Sameer, he seemed to spend more time spray painting vans and the like than actually hacking. He is decorative enough but I don’t think he has come close to recapturing his acting form in Rang De Basanti. Om Puri makes a return as Malik, who is on his way to retirement. His role seemed to set up Roma as his successor in the force rather than actually doing anything. The European support cast are surprisingly not completely terrible so that was nice to see. The music by Shankar-Ehsan-Lloy is unimpressive, and the couple of dances were also underwhelming. What on earth was Hrithik Roshan doing when he was supposed to be waltzing? All that tippy toeing round in circles was ridiculous. How much cooler would it have been if the character ‘impersonating’ Hrithik had ripped off a prosthetic thumb instead of a mask! The closing number over the titles was fun for the Bond flavoured visuals. The action is brilliantly executed. Matthias Barsch did a fantastic job of maximising the impact of the star talent and seamlessly integrating doubles for the tough stuff. Shah Rukh was Don fighting for his life, waiting for his break and ruthless when it came. Priyanka’s action scenes are as physical as any of the men, and she gives the effort and intensity that makes Roma a ‘junglee billi’. Don borrows liberally from Bond and Mission Impossible etc, but the whole genre is built on one-upmanship. A stunt in one is pushed further and faster in another and so it goes. It’s not the style for delicate psychological insights and introspection as it is about what happens next. The pace is perfect and I never felt that things dragged or went too fast. The locations are used well, and really add something to the flavour of the film. I like a big glossy action thriller, especially when the anti-hero is having as much fun as Don. For me, Don 2 builds on the 2006 version and gives great bang for your buck. It’s pretty clear the way has been paved for another adventure. Roll on Don 3! Heather says: The problem with sequels is that they often try too hard to be bigger and better than the original and end up failing rather spectacularly. Don 2 doesn’t. It is bigger, better and more spectacular than the first film and I loved it! Farhan Akhtar’s previous Don was one of my favourite Shahrukh Khan films and this is the first film since Om Shanti Om where I have wanted to watch the film again right away. Shahrukh Khan is so very, very good at being bad. I much prefer him in a negative role where he can be totally evil and chilling and yet in the blink of an eye change and schmooze with his leading lady or charm his erstwhile enemy into taking part in his latest scheme. Yes, there were parts that didn’t work as well but once Don was back on-screen these faded from importance. 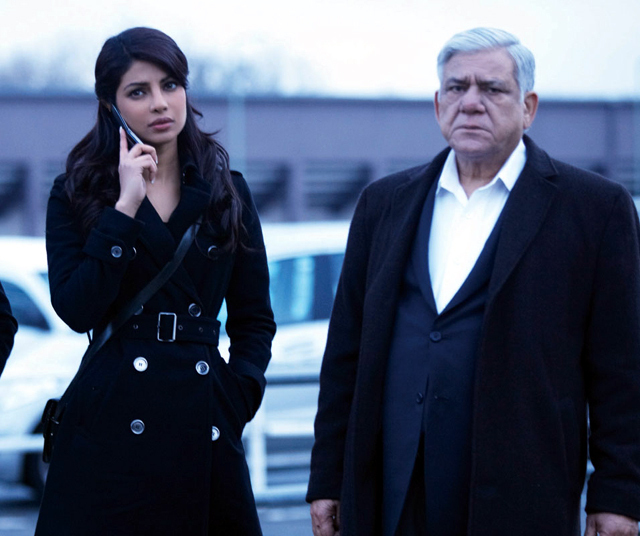 Priyanka was great in the action scenes although I still find the plot point that has her attracted to the man who killed her brother and sister-in-law to be a little strange. More believable is her obsession with capturing Don and this was well captured in the story. I also really enjoyed Lara Dutta’s Ayesha who was very capable and clever, and also had the best outfits apart from the dreadful dress in the dance number Temple has mentioned. The whole film looked very slick and polished with great cinematography, in particular for the scenes in Europe. The action was excellently choreographed as Temple said and I liked that there were plenty of good old-fashioned beat ’em up fights rather than too much reliance on guns and other weapons. Although there were enough explosions to keep me happy but nothing beats the crack as Don breaks yet another bad guy! There was plenty of variety in the action shots, helped by the different locations, but each action scene was set up and played out uniquely which was impressive for a movie with so much happening. I did think that Boman Irani’s Vardhaan was a little underused and would have liked to see a little more interaction between him and Don, but that may have made an already convoluted plot just a little too much to follow. I liked Kunal Kapoor as Sameer and appreciated the fact that his character was given a little more depth and empathy, although I think that counts him out as being a Don protégé as he was just too nice. 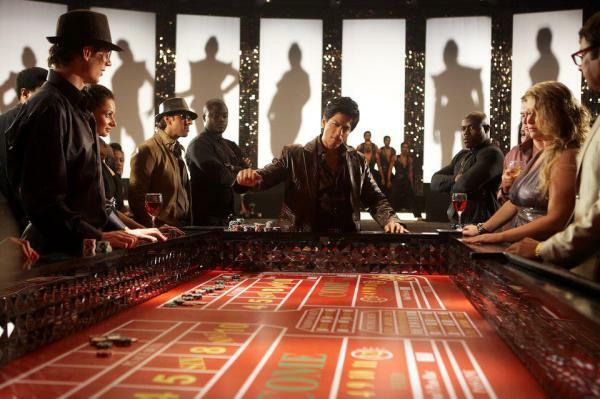 This was such a fun film to watch, with a really excellent performance from Shahrukh. 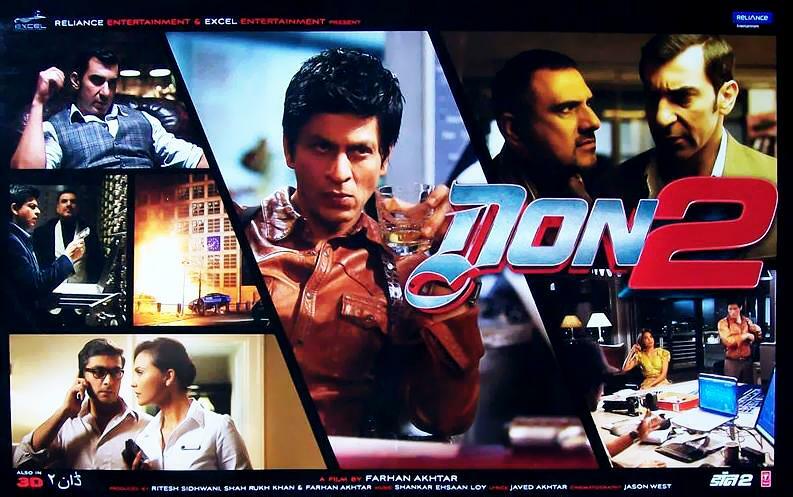 I totally agree with Temple – Don3 next! This entry was posted in Bollywood and tagged Bollywood, Boman Irani, Don 2, Farhan Akhtar, Hindi, Hrithik Roshan, Kunal Kapoor, Lara Dutta, Matthias Barsch, Priyanka Chopra, Shah Rukh Khan, Shankar-Ehsan-Loy, SRK. Bookmark the permalink. “The European support cast are surprisingly not completely terrible”–I noticed and appreciated this as well. I liked the Simon Pegg-like German Interpol agent, and was relieved that he made it through the film in one piece. I was also really impressed with the scenes in the bank that the hostages in the background were always busy doing appropriate things (starting to stand up when the lights came on, deep in conversation, etc.) And I like that the one drug lord seemed to be a tribute to Bob Christo. Overall, I liked the cinematography and SRK’s performance, but I felt like it lacked a driving force, either from the characters or the plot. Hi Liz. Yes I found it interestng that Farhan Akhtar as a director had a much stronger focus on detail than Farhan the writer, and that showed in things like the hostage reactions and the supporting actors. I admit I thought of Peter’s Evil Overlord list a few times, but where would the genre be without those old chestnuts! I felt there was a driving force in the story and it was Don trying to draw a line under his entanglement with Malik and squad, and sort out those troublesome loose ends, so that worked OK for me.